The original prize-winning design by Dirk Jan Dijk was modified twice and ultimately realized by the Maaskant practice. The 375 metre long pier (the same length as the pre-war one) has a concrete structure to take up as little beach space as possible. A promenade leads to a clutch of islands with various attractions including a watchtower. The dynamic design of these islands relates them to Maaskant's other recreational project, the Euromast. 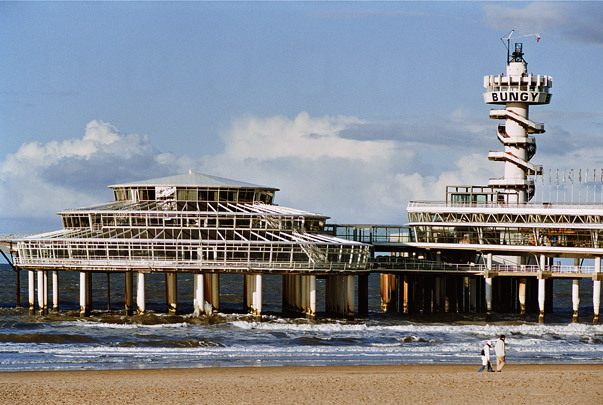 Since the end of the 1960s Scheveningen has been transformed into an amusement centre including a shopping arcade, a casino, a music theatre and the Kurhaus Hotel. The pier has been partly modernized since 1993 after years of neglect; there are plans to build a hotel on one of its islands.